Anglim’s Western Metal Works proudly serves New Mexico individuals and businesses with quality welding and fabrication. Our owners have been in the metal fabrication business for more than 20 years, and our AWS Certified welders are committed to providing quality service and attention to detail on every project. We are AWS certified to build or repair structures, fixtures and machinery made of any weld able material – including but not limited to: stainless steel, aluminum and mild steel. We can complete a welding project in-house, at our location on 8335 Washington St., or we can come to you with our mobile welding unit. We utilize high-tech CNC cutting and shearing technology to ensure all metal cutting is precise and made exactly to specification. Our 5 axis water jet cutting machine, the Maxiem 1530, enables us to make incredibly precise cuts with no heat or danger of warping the metal – allowing us to tackle difficult jobs that others won’t take. 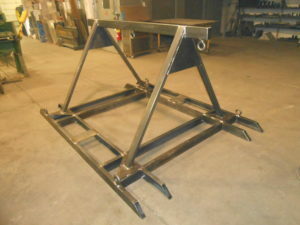 Our team can handle structural fabrication, sign-making, welding and other specialized tasks. We are also ready to tackle creative projects, from aiding in the design of prototypes to creating unique and original metal sculptures and artwork for individuals or businesses. To learn more about our services, or to hire our welding and fabrication team for your next job, contact us today. Call 505.822.9170 to learn more about our welding and metal working services.